The electoral victory earlier this month for the government of Japan, will now permit two major goals of Prime Minister Shinzo Abe to come to fruition. That is a revision of the constitution and a doubling down on the economic policy, that has become known as Abenomics. The elections results were most likely seen as a further affirmation that the Japanese people have acceded to the belief, that there is little alternative to what the government now proposes. 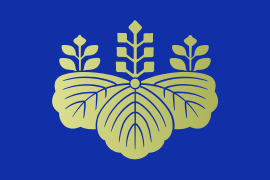 The ruling coalition not only gained seats in the upper house but, was able to capture a super majority. Along with constitution revisionists, the government now possesses a two-thirds majority in the 121 seat chamber. The proposed constitutional changes would loosen military restrictions on Japanese overseas operations. It moves Japan from a strictly defensive posture in foreign policy, to a more flexible one. It is a timely change for a country, facing an increasingly aggressive China. The dispute over the uninhabited Senkaku islands (Diaoyu island group) is the most recent example. The recent Chinese land grab in the South China Sea and its refusal to abide by international law, has raised the anxiety levels in Japan substantially. The ruling in favor of the Philippines by the Permanent Court of Arbitration in the Hague, Netherlands has angered the Chinese government. Although China is now offering bilateral talks with the Philippines in an island dispute, the recent court decision in their opinion must be disregarded. 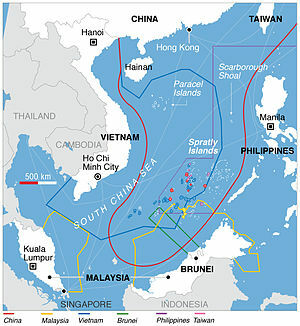 Other nations in the area who also have a number of claims to parcels of land in the South China Sea including Brunei, Indonesia, Malaysia, Taiwan, and Vietnam have become progressively concerned, with the Chinese position in claiming 85% of the waterway. As North Korea increases its belligerence in the East China Sea, especially when it involves nuclear missile activity, the government of Japan is becoming more and more dissatisfied with the constitutional prohibitions under Article 9; against a military buildup. The above events are providing further support to the Japanese Prime Minister, that the time has come for Japan to modify the present strictly defensive posture of the military. According to recent polls, 49% of the electorate now favor a revision of the constitution. It is important to note however, that 44% are still in opposition. The issue will therefore remain contentious in the Diet. In addition, Prime Minister Abe has taken the results of the election, as a mandate for him to further proceed with the three arrows of his economic agenda. They are fiscal stimulus, monetary easing and structural reforms. Together these initiatives are supposed to reverse the deflationary cycle that had gripped the nation for more than two decades. This was the result of the stock market crash and real estate bust that occurred in the early 1990’s. Abenomics has been in place since the Prime Minister was reelected in December of 2012. The immediate goal is to boost domestic demand and raise internal inflation back to a moderate level of 2%. Together these two objectives are supposed to bring back growth and begin to expand the Japanese GDP (Gross Domestic Product). Despite massive stimulus beginning in 2013 and vigorous policies of quantitative easing, inflation has continued to fall. Part of this is attributable to the plunging price of international oil. The other factor continues to be, the general lack of additional demand in the Japanese economy. The structural part of the reform agenda has been by far the most difficult to enact. Increasing competition is only really possible with the introduction of new trade agreements and major reforms in the country’s antiquated labor markets. Trade relationships and labor reforms remain controversial and have been difficult to pass in the legislature, because it threatens various traditional bastions of political power in Japan. Leaders of prospective member states at a TPP summit. Prime Minister Shinzo Abe has been a strong proponent of the Trans-Pacific Partnership (TPP) as an avenue of growth for the Japanese economy. Other structural reforms to increase Japanese competitiveness have largely fail to move forward. These would include cutting corporate taxation,a reduction in business regulations and further opening up of the agricultural sector to more market forces. A large fiscal stimulus began in 2013, when measures were passed to spend a total of ¥ 20.2 trillion yen the equivalent of $210 billion USD (United States Dollar). Nearly half of that ($116 billion) was in the form of direct government spending. It would end up being the second largest stimulus legislation ever and was used mostly in the infrastructure sector. An additional ¥ 5.5 trillion was added in April of 2014 and after the elections of December 2014, ¥ 3.5 trillion would be placed on top of that. It is now being reported that as a result of the election, the Prime Minister is looking to pass an extra stimulus worth some ¥ 20 trillion. This would be near double the original plan. In response to the news, the yen has dropped to a new six week low against the American dollar. The yen has lost 50% of its valuation against the American dollar since the end of 2012. 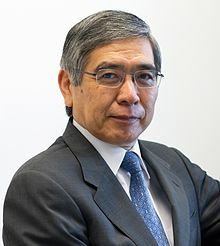 The Bank of Japan (BOJ) governor Haruhiko Kuroda, insists there will be no escalation to what is known as helicopter money, that is directly underwriting the government budget deficit but, investors are becoming increasingly wary of such assurances from the central bank. At that point, the distinction between fiscal and monetary policy would become blurred. The central bank has engaged in a tremendous amount of quantitative easing, as part of the monetary portion of the second arrow in the Abenomics quiver. Since 2013, an unprecedented amount of asset purchasing has taken place. In that year alone, the balance sheet of the BOJ doubled as a result. The Japanese central bank would soon move into endless quantitative easing, when inflation failed to reignite. The amount is close to $660 billion USD in yearly asset purchases, that will now continue indefinitely. The amount being acquired is unprecedented and quite alarming. The assets held by the central bank now exceeds 70% of Japanese GDP. For comparison, the level held by the United States Federal Reserve and the European Central Bank still remains, below 25% of their respective GDP. The economy of Japan continued to stagnate in 2015 going into 2016. The BOJ then took the unexpected and almost desperate step, of introducing negative interest rates. Bank officials insisted that this would at long last, increase the amount of internal investment and lending. The Japanese have now joined the Euro-zone, Denmark, Sweden and Switzerland in the surreal monetary world of zero and negative interest rates. This maneuver will add enormous pressure on bank profits, insurance and pension programs in Japan. It is no wonder that the Japanese Government Pension Investment Fund the largest trust in the world at $1.4 trillion USD, lost a whopping $50 billion USD in the last fiscal year alone. The amount of debt in Japan being amassed is enormous. Depending on various sources, sovereign debt has grown to previously unprecedented levels. Debt to GDP ratio reached anywhere from 229% to 245% in 2015, and is projected to move higher this year. It was already at an exceptional high rate before the financial crisis. In 2007, it was reported to be 162.4%. In a comparison, the United States rate last year was 104.17%. The rapid run up in debt will become more problematic,since the increase to 10% in the national sales tax scheduled for April 2017, has been postponed until October 2019 . The 5% rate had already been hiked to 8% in April 2014. The last addition to the national sales tax in 2014, tipped an already sluggish economy growing at an annual rate of just 1.3% into recession. However a 30 month delay, will cost the treasury 2% of GDP. Although economic growth did pick up in 2016 to 1.7% in the first quarter, it followed a contraction in the last quarter of 2015. Since Prime Minister Abe came to power in 2012, the overall economy has grown just 2.4%. This just manages to bring the GDP back to the level that existed in 2008. It is becoming increasingly challenging to sustain growth in a rapidly shrinking population, especially among working age adults. This unfortunately is now coinciding with a present environment of declining global growth as well. The problem for Japan is that the excessive levels of debt being generated are totally unsustainable. The national debt is at $11 trillion USD and still rising. There is a further risk that the present monetary policy, could well lead to hyperinflation in the long run. Also negative interest rates may not deliver the desired effect in investment and spending. It could well result in the opposite, that is a hoarding of cash. 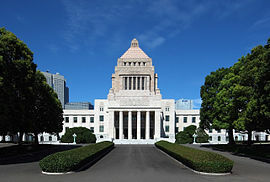 The Japanese government with its present electoral majorities, now has the advantage to pass whatever legislation it deems necessary, to combat the ongoing economic crisis. However, it now also holds full responsibility in arriving at the outcomes, that have been promised for a number of years. Prime Minister Abe was elected to solve, the decades long economic slump. If he fails to accomplish this task, the voters will attempt an alternate solution.